Shaikh Salman Bin Hamad Al Khalifa, Bahrain's crown prince on April 23, 2009. Editor's Note: Joost R. Hitlermann is Deputy Program Director for Middle East and North Africa at the International Crisis Group. Ever since the Arab Spring began, Washington has been faced with the question of how to ease autocrats from power. After former Egyptian President Hosni Mubarak was forced from office in February, President Barack Obama said that the United States had been on the "right side" of history, suggesting that that is where Washington would position itself in the Arab world's transition to democracy. What exactly this should mean in practice remains an unsettled question - especially in states presided over by dictators whose stable rule and pro-U.S. orientation were long-standing cornerstones of U.S. strategy in the Middle East. This dilemma is particularly salient in the case of Bahrain, a small island kingdom in the Gulf and a longtime U.S. strategic ally. For months now, Bahrain has been engulfed in protests against the repressive rule of the Khalifa family; the most recent demonstrations in late August claimed the life of a 14-year-old boy, the latest casualty in the regime's drive to restore order. In Egypt, Mubarak fell from power with the rhetorical urging of Washington, but not before the United States faced criticism from across the region - from many Egyptians, who believed that Washington dithered and weighed in too late, and from Saudi Arabia, which saw the Obama administration's endorsement of Mubarak's ouster as a deep betrayal of Saudi Arabia's friendship and alliance with the United States. In March, fearful of a repeat scenario in its own neighborhood, Riyadh sent troops to Bahrain to prop up the ruling Khalifa family under the guise of the Gulf Cooperation Council (GCC). Like the Mubarak regime was, the Khalifas are U.S. allies who have come under sustained pressure from an embittered populace. Bahrain's nominal ruler, King Hamad bin Isa al-Khalifa, reportedly extended the formal invitation to the GCC, of which Bahrain is a founding member, to invade. The real power in Bahrain, however, is the king's uncle, Khalifa bin Salman al-Khalifa, the longest-sitting unelected prime minister in the world, who over the course of his 40 years in power has seen his country gain independence from the United Kingdom in 1971, transition from his brother Isa to his nephew Hamad as monarch in 1999, and turn from an emirate into a monarchy in 2002. Read: The Libyan oil tap. At the same time, despite its lack of significant oil and gas reserves, Bahrain has grown into a regional economic and financial powerhouse. Prime Minister Khalifa stakes his legitimacy on having shepherded this growth. But his repressive tactics against dissent and his failure to curb corruption and widen the space for political participation fueled the protests that began in February. Washington is concerned. Bahrain is perhaps even more important to U.S. policy priorities than Egypt: The country is an Arab state strategically located across the Persian Gulf from Iran and hosts the U.S. Navy's Fifth Fleet. Moreover, Bahrain is a critical link to the decades-old U.S. effort to protect the Western world's access to Gulf oil. As the Arab Spring unfolded, the Khalifas were not very different from other U.S.-allied autocrats in the region. Although Bahrain is in some ways more open than either Mubarak-led Egypt or Saudi Arabia - political parties operate as "societies," for example, and some independent media outlets do exist - the Khalifas remain just as unaccountable as their royal brethren in other GCC states, seeking to pacify the population by spreading the country's wealth. Moreover, in a nation with a majority Shiite population, a Sunni-led autocracy has deepened sectarian fissures. For its part, Washington has been concerned for some time that by keeping the Shia down, the regime might end up driving them into Iran's arms. When demonstrations broke out in Bahrain, the Obama administration had to take special care. It realized that Bahrain would be better stabilized by finding an accommodation between the regime and the opposition than by repressing popular sentiment. Washington therefore seized on King Hamad's initiative to allow protesters to gather peacefully at the Pearl Roundabout several days after the protests started in February and encouraged his son, Crown Prince Salman, to engage in semi-secret talks with the main legal opposition groups. It initially seemed there was a prospect of serious dialogue moving toward genuine political reform. As protests grew and spread to other parts of the island, however, and protesters' demands escalated from the removal of the unpopular prime minister to the replacement of the monarchy with a republic, U.S. officials raced to keep alive the faltering talks, hoping to stave off a violent response from the regime. Assistant Secretary of State for Near Eastern Affairs Jeffrey Feltman shuttled between regime and opposition figures, and between Bahrain and its GCC allies for several days in mid-March. On March 12, Defense Secretary Robert Gates visited Manama, where he criticized the regime for its "baby steps" toward reform. None of this sufficed. Two days later, Saudi troops marched across the causeway connecting Bahrain with Saudi Arabia's Eastern Province, which also has a large Shia population. A prolonged violent crackdown ensued. It remains impossible to say whether the GCC intervened to prevent the fall of the Bahraini monarchy or to preempt the political compromises that Prince Salman was publicly declaring he was prepared to make. Those reforms would potentially have put the country on the path toward a constitutional monarchy with an elected prime minister and a Shia-majority parliament, a prospect that frightened both Prime Minister Khalifa, whose job was at stake, and the Saudi ruling family, which sees a Shia ascendancy as tantamount to empowering the mullahs in Tehran. At the heart of this enigma stands Crown Prince Salman himself: Was his offer to the opposition genuine, or was it a ploy to gain time and persuade protesters to go home? Both the Obama administration and Bahrain's legal opposition societies appeared to trust him; many of the Pearl Roundabout protesters did not. U.S. officials have invested a good deal of time and energy in the 41-year-old crown prince, whose Western education and liberal outlook have made him a natural interlocutor for Washington. By contrast, U.S. officials have had limited access to Prime Minister Khalifa and the hard-liners around him. During the height of the crisis, the Obama administration reportedly tried to find a way for the prime minister to step down and make way for someone from outside the ruling family. This attempt failed, and the GCC-sponsored crackdown may have further entrenched Khalifa. How Washington should now proceed is an open question. If Crown Prince Salman is serious about reform, then the United States should apply steady pressure on the regime to move beyond phony attempts at national dialogue and return to inclusive talks that embrace the spectrum of political opposition. Prince Salman would essentially have to pick up from the point where talks broke off in March. The objective of such a process would be a transition to a constitutional monarchy, the redrawing of electoral district boundaries to more fairly represent Shia constituencies, and the empowerment of parliament to elect the prime minister. If, however, the royal family (the crown prince included) has decided that it is done with compromise and it becomes clear that any offers to that effect are simply attempts to deceive the opposition into calling off street protests, then the Obama administration will find itself in a real bind. The regime's current track - an ongoing crackdown and a dialogue with its own supporters rather than with the opposition - will almost certainly lead to further sectarian polarization and political radicalization, and possibly to greater violence. The Obama administration should test the regime's intentions by setting two clear initial benchmarks: the prompt release of jailed opposition leaders and a genuinely inclusive dialogue with them and the groups they represent. Should the Khalifas fail this test, Washington would then have to consider assuming a tougher posture, including threatening to scale down security assistance and even to relocate the Fifth Fleet. Although the U.S. defense cooperation agreement (which governs docking rights at the base) does not expire for another five years, the discussion about the wisdom of keeping the U.S. Navy in Bahrain has already begun among regime critics in Washington and elsewhere; further repression would only give the notion greater currency. Increasingly, these critics may find support in Bahrain itself. Until recently, many Bahrainis viewed the naval base as a safety valve against even harsher regime repression, but if they find the United States unwilling or unable to press the regime toward meaningful reform, public opinion might soon turn against Washington, including the Fifth Fleet's presence. Washington retains real leverage over the regime. Bahrain is firmly under the U.S. security umbrella in the Gulf, and the United States provides Bahrain with funding for military purchases ($19 million in 2010) as well as military training assistance. The United States should be more assertive about using this influence: The current policy of continuing military-to-military relations without regard for the political and human rights situation is counterproductive, could be interpreted as violating U.S. law, and exposes the Obama administration to accusations of double standards in its approach to the Arab Spring. For the moment, Bahrain is the first successful chapter of the Arab counterrevolution spearheaded by Saudi Arabia - it is the place where the West has broken its promise to support the Arab people in their struggle for a greater say in politics and greater control over their destinies. It is time for the Obama administration to push the country back onto the road toward reform, using pro-democracy forces within the regime, its supporters and the opposition to show the way. The views expressed in this article are solely those of Joost R. Hiltermann. Here's another bozo who needs to be indicted and by the ICC and prosecuted but won't thanks to the right-wing thugs in both London and Washington. Again, justice will not prevail but Capitalism will!!! As long as this Shia/Sunni conflict dvides the region, the U.S. walks on a very thin line. It had turned a blind eye to the suppression of the Shia protesters through the Sunni rulers in Bahrain, to avoid a fall out with Saudi Arabia and stands idly by, while the Shia/Alawite regime in Syria cracks down the Sunni protesters. It is interesting to see what the boomerang effect will be like in the near future. If there was ever a true face of evil in this world today, this King Al Khalifa of Bahrain fits the bill perfectly! By supporting this creep, we're only showing our own hypocrisy about our preaching the rise of "democracy" in the Middle East which is not exactly on the rise at all. The bottom line here is that Washington wants to remain dominant in the Middle East and that's all there is to it! Many people unfortunately with very little information seem to come up with very big generalization and conclusion. This, in the scientific field, is nothing more than nonsense. The majority of Bahrain's citizens (without referring to sects) are seeing their lives improve since the beginning of the reforming period and democratization process 9 years ago. With an elected house of representative and a bicameral parliament, with the free health care, free education, 80% support the establishment of small, medium, and large private businesses, 10th freest economy in the world, largest female percentage employment in the gulf, 3.6% unemployment rate, and more, Bahrainis are moving forward. The reform and democratization process has never stopped. When you and the writer misunderstand what democracy is all about, you also miss understand what the goals of the developing world is all about. The developing world targets prosperity through an ideology that democracy helps it achieve this goal. take a look at prosperity, is Bahrain moving towards that path? This is what you should be concerned about. With logic, why would a starving person refuse your food? Well, he first needs water. Another question you should ask yourself. Many take for granted that any country that is not fully democratic, is by default oppressive. If so, please present any single evidence that shows the Bahrain government is indeed a repressive government. Now that's exactly what the right-wing news media wants us to think. After all, this King Al Khalifa is no more that a stooge for Washington!!! John, you are obviously not a person who has spent any time here in the Gulf. King Hamad bin Isa Al-Khalifa is far, far away from being a face of evil. On the contrary, he has provided his people, all sects, with a level of economic security and social amenities that would grace the U.S. There are housing projects, mostly for the Shi'a people, free medical, infrastructure innovations and upgradings, as well as full employment. This in a country that does not have any huge natural resources. However, for many years, there have been acts of vandalism and terrorism against innocent people from the sub-continent and the Philippines, and calls for the death of the royal family. No government on Earth, whether democratic or tyrannical will permit the chaos that many in the so-called "protesters' camp" have unleashed. Thanks to the King and the system, the vast majority of people of all communities and foreign residents enjoy peace, tranquility and harmony in a wonderful and beautiful small country. We have 28 minestry 17 from al Khalfa an 7 from suna and 3 from sheat ! Bahrain is an island contains from 33 island bahraine peapole know only tow islands !! In 1969, UN made a voting to let Bahrain people select between join Iran or to be an independent arab state with Al Khalifa rulling the state (Shia population at that time was 80-85%), people select independent state with two condition, elected parliament and elected prime minister, in 1973 People elected their parliament members, but the ex. amir Sh. Isa appointed huis brother Skaikh Kahlifa to be PM against people well, and declare an emegency law in 1975, and kick out all shia people from all Min. of interior and the army and brought other nationalties from Pakistan, Jordan, Syria and Yemen beside his loyal guard to protect him and implment his politcal agenda to change the demographic population of the country. In 1979, the islamic revolation in iranian started and Sh. Khalifa made an advatange of it to increase pressure on shia people by removing them from critical ministries such as Min. of forigen affairs or Min. of Finanace. Bahrain is the smallest country in the arab world, half of it is a military air base and people can go their, other lands were steeled by the royal family members, Bahrain is an island, people can find one beach to swim, they can not smell the sea because most of royal family built a wall and made a private beach for them. In 1999 when the ex. Amir died the new amir change the state to monarchy to become a king, and he promise people that he will give them an eleccted parliament as it should be in 1973, but it was an empty promise to fool people and the hidden agenda continue, more thousands expacts and other nationalities were brought and were given a Bahraini nationalty just to vote for the king, while the orginal people of the isalnd were forgetten and stay without any job or future, although most of them a high educational qulaification and very intellginat, Bahrain population change from 200,000 in 1971 to 700,000 in 2005, but recently in 2010 the government dclare Bahrain population was 1,150,000, see the huge increase in the population in just 5 years, we are a very rich country and very small, but still you can find people seeking job and work. If you look at the pro geverment supporters you will find that they want this situation to be continue because the are taking the fruit of the hiden agenda, and we are beaten the other nationalities who are wearing a military unifrom (as per law ther are Bahrainis), any one he need to argue more, I advise him to make a reserach of the king and his uncle wealtha and fortune, what you will expact (Both have more than BD 300 billions, (1 BD=$ 2.3), sooner or later people will won the battle, the U.S adminstration should make their decsion as early as possiable, because history in the arab world is changing now, otherwise we will support only the countries that support us, like Iran and Iraq. "repressive rule of the Khalifa family; the most recent demonstrations in late August claimed the life of a 14-year-old boy, the latest casualty in the regime's drive to restore order." This is utter garbage as always. This child did not get hurt during any demonstration but was dumped by 3 unknown adults at the hospital with wounds that do not and can not come from teargas canisters. We do not have a repressive rule. We had a beautiful peaceful life with free healthcare -education and jobs for those WILLING to work. Unfortunatly the (protesting) youth seems to think parents owe them, pocket money and the government should provide easy jobs in air-conditioned office where they put up their feet and make the Asian underling do their bidding and jobs. And "peaceful" protesters daily target poor Asian workers "because they say they take their jobs". Jobs in outdoor conditioning's like construction etc that they don't want to do themselves but also don't want anybody else do-trying to hijack progress en force the country to a standstill, while trying to decide WHAT do they want exactly. decent standard of living – check everybody who can afford a blackberry and car is NOT poor. Freeways- underpasses and overpasses – utilizing foreign workers. And since our youth doesn't want to be seen breaking into a sweat doing a honest job – but rather plays games online – twitter the unfairness of this and that or go out with friends to one of the mega shopping complexes after spending hours in the barbers having beards and hair styled according to the latest fashion, out of boredom they decided we WANT en we will TAKE. Thanks but no thanks if these youths are going to be our future we might as well pack it in an move somewhere else. Mind you not all are like this but the MAJORITY is to lazy to get out of bed and work for a living, starting at the bottom rung of the corporate ladder. There is NO ligitimate reason for the daily barrage of protesters holding up traffic, targeting firetrucks- ambulances – and police with firebombs bearing flags with 11 triangles. Now who is for the country not them , but us that go to work do our jobs and try to get on with life and family but are unable because of riots. You don't want OUR kingdom feel welcome to go somewhere else to live and see if you have a better one. You want a western type democracy in Bahrain dear rioters – be prepared to give back upto 60% of your salary in taxes to pay for the unemployed people -like the westerns have to – pay for your medicine- doctors -school – etc just like westerners do. Since rioters and protesters only want to take but not contribute WESTERN style democracy can remain just that WESTERN. And westerns trying to dictate the Middle Easter and Muslims countries – let me quote Matthhew 7:5 You hypocrite, first take the plank out of your own eye, and then you will see clearly to remove the speck from your brother's eye. More right-wing bla-bla-bla in support of this cursed King Al Khalifa of Bahrain. One would think that the above was posted by the C.I.A. itself! We are seeking freedom, we demand elected government, we demand elected prime minister who stay in the job not more than 4 years, twice as a maximum, not like the current prime minister from Al Khalifa "the king's uncle, Khalifa bin Salman al-Khalifa, the longest-sitting unelected prime minister in the world, who over the course of his 40 years in power", we demand a fair chances to all Bahraini to vote, one vote for each Bahraini, we demand an independant judgment councel that people, or any association can raise a court case with evidence to get the justice. We are a very rich country, why we do not have a free education, health, this is our rights as a citizenship. Let me ask you, if you are a Bahraini shia, you are NOTallow to work in police forces or any middle or high position in ministry of interior!!! !, you are NOT allow to join the army!!!! you are NOT allow to take middle or high position in ministry of Justice, For your information , Bahraini shia are almost nowdays is around 55-60% of poulation, although if we are 5 or 10% we should have the same right as any body else in the island, if we have 30 ministies, 20 of them is headed with shaikhs from Al Khalifa family appointed directly from the king, NOT selected by the people, Al Khalifa family consider the Bahraini people as a slave and they assumed that we are living in the MIDDLE AGES, In the 60s Bahrain was a model modren country comparing to other GCC countries, now all of them get ahead like UAE, Qatar, Kuwait and and we get back because of Al Khalifa steeling. The 14 years boy died by the police force and their are many witnesses saw the the incident and they reported to the police, however, the official report from the police say same your story, we know we are right and we will continue our way to get freedom, this is our destiny for better future to our next generation of all Bahrainis "Sunni and Shia" who stay in the right side, I wish the cloud will go away from your blind eyes to see the truth, just have a few minutes and go around in your country, go to Sitra, Go to Malkiya, go to Duraz, go to Nuwaidrat, Go to Maameer, Go to Eker, Go to Dumistan , Go AAli, Go to Manama, Go Daih, Go to Jidhafs, Go to Samaheej, Go to Bani Jamra, Go to Buri, but if stay in Muharraq and Riffa, for sure you will be blinded and will talk like one of alkhlifa family the criminals. More and more people worldwide are finding out how clever media manipulation by the protesters showed not the real or whole story but what they wanted they world to believe. 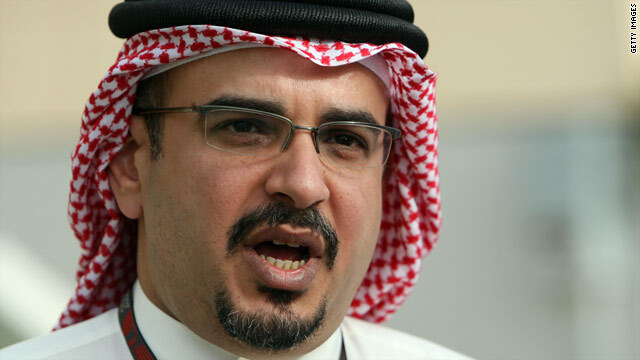 Nice to inform us to finding out that the reliable source Dr Saeed Shehabi, 56, runs the London-based Bahrain Freedom Movement, which seeks to topple the King of Bahrain. It was revealed that Dr Shehabi has made speeches supporting Iranian hardliners, and worked for 13 years in offices owned by the government of Iran. Slowly the world is waking up and no longer taking at face value the ramblings of the so called opposition like the Alkhawaja clan and their followers. Or the human right societies under their control, human rights? They did and do not protect or voice the human rights of the foreign workers, police of others that get hurt during "peaceful " demonstration, or those that are targeted daily for being against the trouble they are continuing to make day in day out. We have have Shia -Sunni – Farsi – Holy – Western – Asian members in my Family – and no the Asians are not the household help but fully accepted wives /husbands. Quite recently a half Shia/sunni person working in the ministry of the Interior published the names and addresses of undercover police – who's families and their loved ones lives were put at risk because of threats to their lives. Bahrain has a deficit – meaning they spend more than they are making and having to borrow money from other countries and international banks to keep up the population growth and demands. It is by no means a rich country in monetary terms. Don't compare us to the other GCC countries that are rich in land and natural recourses. Bahrain is rich in one natural resource its people, that are demanding more and more without willing to give back or contribute for the good of all – but selfishly only think about themselves. You I quote said" why we do not have a free education, health, this is our rights as a citizenship" . Really that is your view, (and since you like like western style democracy) wake up Talal it is not your right but a huge benefit of you living in Bahrain. That is democracy in the "free world" for you . They will tax you even when you are getting buried – and after a few years dig up your bones and sell your grave to somebody else. You call yourself a slave? I would not call it backpedalling. I think no matter how large a superpower is, it cannot be everywhere at once. Takling Bahrain, even just with words, would loose Saudi Arabia, maybe other, which would make impossible to intervene in Syria, Iran, or even stabilize Lybia. I think its a good idea to create a solid north african democratic zone before moving further. Personaly I think even Algeria need to be dealt with, as well as the most extreme african dictatorship. If Africa become democratic, the rest will follow. Another reason is that China push is in Africa. Giving time, who know what their plans were ... Cuba-style nuclear missile silos. Pan-african chinese coalition of autocrats. Your worst nightmare. Double standard... what double standard? Very opinionated article. I live in Bahrain – I am not repressed. I enjoy being able to go where I want, when I want. I can travel outside the country anytime,and do. It is generally a safe place, until as of late. The major thing that the author fails to recognize or acknowledge, probably because it is not controversial enough, is that what is going on in Bahrain is NOT a national agenda item. It is not something the "people of Bahrain" want. There are issues, and they need to be solved. The small economy of Bahrain allows its faults to be felt sooner rather than than getting lost in the big economies of larger countries. These larger countries face the same issues. The problems in Bahrain are sectarian now. They may have started as true desire for reform, but it got hi-jacked by extremists who were after something a lot bigger, and a lot more sinister. The people of Bahrain were betrayed by those with ulterior motives.